Imagine…you’ve just learned white nationalists are planning a rally in your town. You can’t sit back and watch this happen. With just a couple weeks notice, you and your neighbors decide to organize a counter-protest. You need buses to bring in community supporters along with food, child care, translators, and the list goes on. Just $500 would make the difference, but you don’t have it, and you don’t know anyone you could ask. In the next few years, such “rapid response” situations may become all too common. Social Justice Fund will be uniquely positioned to help — and you, our donors, will make that possible. That’s why we’re writing with one final message before the end of the year to let you know about a special opportunity to support our grantees during this challenging political moment. In early 2017 we’ll launch a new Rapid Response Fund. We’re asking you to help us raise $10,000 by January 1st to start it off strong. Additionally, a few generous donors have already committed an extra $10,000 to match your gifts. Together, you’ll help set our grantees up for success when urgent social justice needs arise. In many ways, SJF is already doing what this political moment requires: funding grassroots organizations working on systemic change, especially in under-resourced rural areas and communities of color. In another sense, we know that all of us are required to step up with new urgency and strategies. This is not a moment to sit back and wait. Our grantee organizations have already leapt into action. Colectiva Legal del Pueblo is organizing “Know Your Rights” and deportation defense workshops in immigrant communities across Washington. 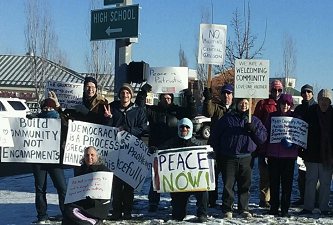 The Montana Human Rights Network has been responding this month to anti-semitic threats and harassment by white supremacists in the town of Whitefish, and has organized a “Love Not Hate” rally on January 7. As these groups respond quickly to defend their communities, SJF is in a unique position to mobilize people like you in support of our Rapid Response Fund, helping to build a strong line of defense NOW. If you’ve already supported SJF this fall, we thank you and ask that you consider making an additional gift to support our new Rapid Response Fund in 2017. If you haven’t yet made your gift to SJF, this is a great way to jump in and do something that will create positive change in the year to come. PS: You can feel secure in knowing that your investment in the Rapid Response Fund by January 1st will help organizations protecting vulnerable communities leap into action at a moments notice. Thanks to a generous $10,000 match, your gift will go even further. I look forward to telling you more about the impact these Rapid Response grants make in 2017!